It was common practice some two centuries ago to dispose of household refuse near where it was generated, and out-of-the-way spots near the back doors of kitchens were particularly popular dumping grounds. In archaeological parlance such trash deposits are known as middens. The word "midden" has a surprisingly long history, though George Washington never used the term. According to the Oxford English Dictionary (OED), a midden refers to a dung-heap, refuse pile, or a domestic ash-pit (OED Online 2012). The origins of the word come from Scandinavian roots, appearing in print beginning in the fourteenth century. The OED's definition for midden in an archaeological context characterizes it as a "refuse heap which marks an ancient settlement, consisting chiefly of shells and bones and often also discarded artefacts." 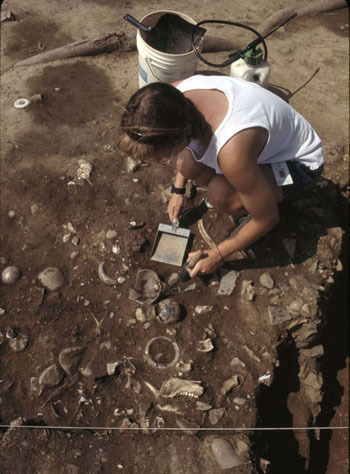 Danish scholars first used the term to describe archaeological remains found in the mid-nineteenth century in association with shell heaps from antiquity. 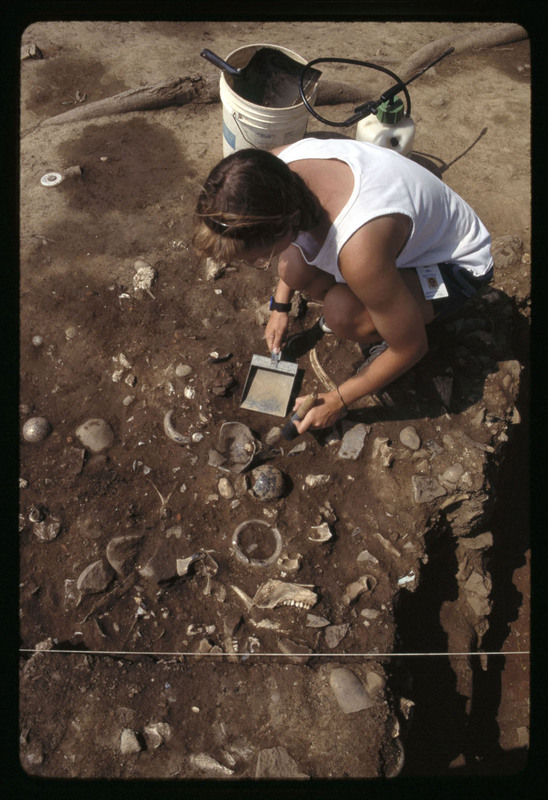 The term "trash pit" in archaeology is used to describe a feature where refuse was discarded over a few episodes. Historical archaeologist Ivor Noël Hume (1968) suggests that trash pits had short lives, and were usually sealed over purposefully to prevent nasty smells and animal disturbance. However, we think that some fairly distasteful smells probably emanated from the South Grove Midden (especially considering all the fish remains) and provided food for foraging animals (some of the bones show the teeth marks of rodents). The trash built up over the succession of early households at Mount Vernon and spanned approximately four decades – we found no evidence that the trash was covered or sealed in any way. One attribute that the South Grove Midden lacks when compared to the OED definition is that it is not a heap or a mound, and left little physical evidence above ground to suggest its existence. The midden's location, behind the kitchen on a gentle declivity which extends to the Potomac River, provides the reason why. Deposits of household trash were often placed in depressions (natural or man-made, such as privies and disused wells or cellars), which overtime, could help to level out uneven ground. The surface below the feature suggests a natural depression, perhaps where a large tree had fallen down. It seems there was some conscious effort to fill in this depression with refuse. The majority of the trash accumulated from c. 1735 to 1775, when the yard surrounding the midden was turned into the South Grove, a formalized area planted with flowering shrubs and small trees. 2012	"midden, n." OED Online. Oxford University Press. <http://www.oed.com/view/Entry/118135?redirectedFrom=midden>. Accessed 4 January 2013. 1968	Historical Archaeology. Reprinted 1974 by Alfred A. Knopf, New York.